Wednesday, November 8th, marks the 52nd anniversary of the Higher Education Act. It was established November 8, 1965 by President Lyndon B. Johnson to provide financial aid for college students. 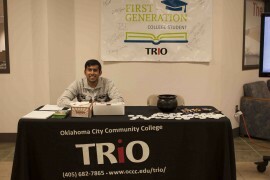 The OCCC TRIO programs celebrated the anniversary, and honored first generation college students in the main building on campus. The TRIO programs help prepare high school students for college, guides college students towards graduation, and through transferring to four-year universities. The programs offer financial resources for low-income students, and advisors for counseling and support. First generation students are strongly encouraged to join. (Left) TRIO advisor Monica Suyo and Director of TRIO Grant Programs Lathonya Shivers (right). Photo by Natalie Nell. There was a booth set-up with informational pamphlets, applications for TRIO, snacks, “First Generation College Student” buttons, a poster where first generation students can sign their name, and a television broadcasting videos of national TRIO achievers. 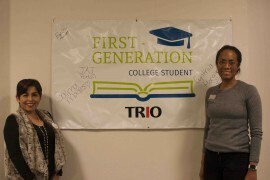 Lathonya Shivers, Director of TRIO Grant Programs, says the TRIO programs have partnered with the National Association of Student Financial Aid Administrators, or NASFFA. “Our organization honors national achievers,” she said. Jennifer Barrett is Assistant Director of TRIO and says the program is a wonderful organization for students to navigate through college. “When you don’t have someone in your family that’s attended college, it’s a more difficult process.” She also said the Higher Education Act was a “good measure” to assist first generation students. Regena Wright is the Administrative Assistant for the TRIO programs and says it’s very rewarding seeing students graduate and become successful. She’s been with the programs for seven years now, and acknowledges change overtime. 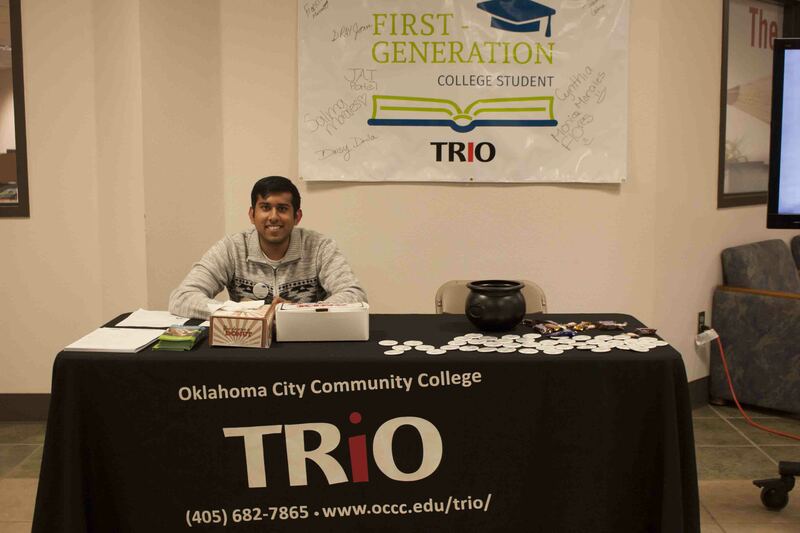 Jai Patel, business major at OCCC and a member of TRIO. Photo by Natalie Nell. Monica Suyo is a TRIO advisor and joined OCCC this August. She said through academic support she helps advise students with personal decisions that can impact their career and life.